Oriental rugs can experience much stress and wear. The right rug pad will prevent this and add years of life to the rug. Benefits of using a rug pad with your Oriental Rug include protection to the rug against wear and damage, prolonging the life of the rug as well as adding comfort and safety. An Oriental rug pad can actually add years of life to your rug and make it look great during the years of use. Oriental rugs can experience much stress and wear when it is used on a hard floor surface. Rug pads act as a protective barrier between the rug and the floor. The right rug pad is able to absorb much of the normal stress passed on to the rug. 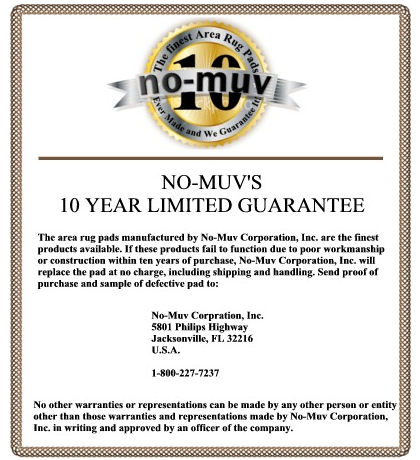 When the rug pad prevents wear to the rug, it preserves the condition and adds years of life to any oriental rug. Oriental rugs are normally made by hand and contain finely tied knots. These knots actually create the fiber of the rug and are part of the structure holing it together and are on the back of the rug. Sitting on a hardwood or hard floor surfaces, the knots of the oriental rug can see much stress. When we walk on the rug or place heavy furniture on it, we push down into the rug and force the knots to rug against the floor. Consistent rubbing of these knots can lead to wear. Since the knots keep the oriental rug together, adding wear to them can negatively affect the condition and lifespan of the rug. The rug pad will absorb this pressure to protect the knots against premature wear and unnecessary damage. 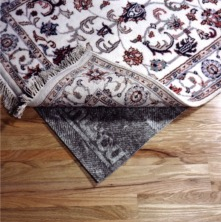 Oriental Rug Pads help to preserve the pile fibers of the rug. When the rug is walked on, this pushes down into the fibers to cause them to be crushed. Dense rug pad actually helps the fibers resist the pressure to spring them back to position. 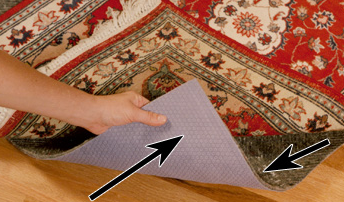 This prevents wear of the pile of the rug and keeps it looking good. Oriental rugs without a rug pad will look flat and used much faster than if it has a rug pad under it. The fibers in the pile continue to get crushed and will stop going back to original position. Benefits of an Oriental Rug Pad include safety. Many smaller rugs tend to slip and slide on a floor. Non-slip rug pad prevents slipping and keeps rug flat and in place. When an oriental rug slips, it can wrinkle. If the wrinkles are constantly walked on, those parts of the rug will show more wear before other parts. Uneven wear to oriental rugs reduces its value and takes away from its life. A non-slip rug pad holds the rug to the pad to prevent wrinkles that can cause uneven wear and dangerous tripping. Top surface (above): Thermal-set ridges on the top surface, in an exclusive pattern of chevrons, running in multiple directions, enables the pad to grip the rug more effectively and prevents lateral motion in ANY direction. Backing (above): Superior natural latex rubber formulation in a new, exclusive hexagonal “tire tread” pattern, plus more real rubber in actual contact with any bare floor, no matter how slippery, and provides the highest degree of non-slip traction.